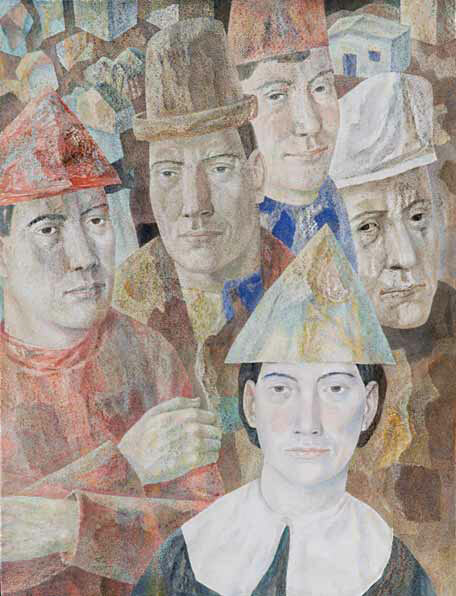 A solo exhibition of paintings, watercolours and drawings by Pavel Zaltsman (1912-1985) from the funds of the Tretyakov Gallery and the collection of the artist’s family opened in October in the halls of the permanent exhibition of 20th Century Art. 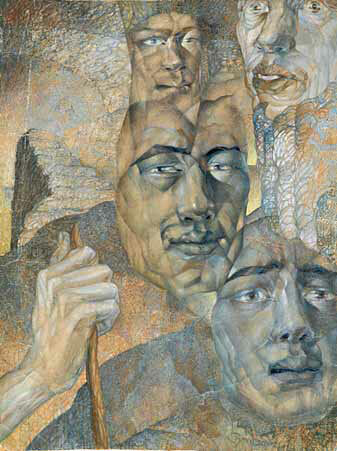 A disciple of Pavel Filonov, Zaltsman was never overpowered by his teacher’s influence and preserved his own artistic identity, having borrowed from Filonov the latter’s approach to the presentation of images most characteristic of the tragic collisions of the 20th century alongside basic metaphysical elements. This rather small exhibition showcased paintings, watercolours, and drawings in ink and pencil, and gave viewers an opportunity to see the main motifs of Zaltsman’s works and his creative retrospective career starting from the first professionally made drawings of the early 1920s through to the last works of the late 1980s (Zaltsman died in Alma-Ata). Pavel Zaltsman was a painter and graphic artist, as well as a cinema artist, a figure fascinated by applied Oriental art, and also an outstanding lecturer in the history of world art. Zaltsman’s prose and poetry have been unknown to the general public until recently. His literary creative experience - irrational and absurdist as it was - brought him rather close to the OBERIUT group, to Zoshchenko and sometimes even to Kafka, but even if in any case incompatible with his paintings and graphic art, it gives an opportunity to realize the inner sources of Zaltsman’s visual artistry, revealing the anti-humane nature of the 20th century. Pavel Zaltsman was born in Kishinev into the family of a Russian officer Yakov Zaltsman, an amateur painter and a poet; the mother of the future artist was Jewish, his father of German-Polish origin. Pavel spent his childhood in Kishinev, Odessa and Berdyansk; in 1925 his family moved to Leningrad. Zaltsman began to draw at an early age but his social background - non-working class - as well as the fact that his father was an ex-colonel in the Tsarist army naturally worked against him: in the 1920s he could not enter any state educational institution. But it did not prevent him from gaining the necessary skills, and by the end of the decade he had become quite a professional graphic artist and painter. 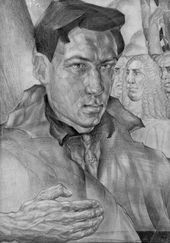 His self-portrait of 1929 made in pencil with some elements of the cubist style clearly revealed his talent. 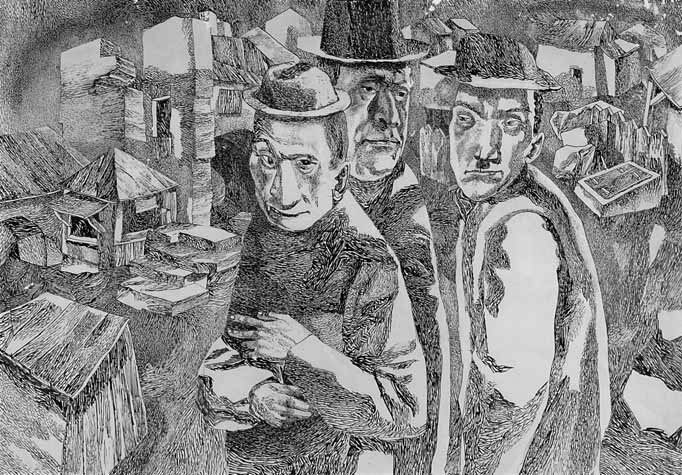 In the late 1920s and early 1930s, under the supervision of the famous theatrical designer Arapov, he became a professional cinema artist and from 1932 began to collaborate with the Lenfilm studio where he worked with such outstanding directors as the Vasiliev brothers and Ilya Trauberg. As he used to say, he "chose films to work on depending on their destinations”, and he felt the particularly strong appeal of Middle Asia. Love for the Orient was, apparently, in his genes and it is no surprise that eventually destiny brought him to Kazakhstan. In 1942, when Leningrad fell under German siege, Zalts-man was evacuated with the Central United Film Studio (TsOKS) to Alma Ata where, due to the German roots of his father, he was under the control of the police authorities. He worked in the TsOKS until the beginning of the "campaign against cosmopolitism”. When he - as a Jew - was fired from the studio, he earned his living by lecturing on the history of world art, which he continued doing later in his life. As his contemporaries witnessed, his lectures were fascinating. Zaltsman managed to lecture without written texts, a factor that helped him escape ideological control. Concurrently, he pursued his lifework - the creation of graphic and pictorial works - as well as clandestine literary activity. In the 1960s he won official recognition and received the title of Merited Arts Worker of Kazakhstan and the position of artistic director of the film studio Kazakhfilm. Zaltsman eagerly applied the Kazakh national characteristics such as mythologism, metaphorism, or contrasting plastic elements in his works for the cinema. He gained recognition from the artistic and museum community, became a frequent participant in exhibitions and some of his works were acquired by museums. A distinguishing event in his artistic biography was his acquaintance with the works of Pavel Filonov. In the early 1930s Zaltsman became a member of the MAI society (Masters of Analytic Art), and collaborated with other members of the society in illustrating the Finnish epos "Kalevala”. 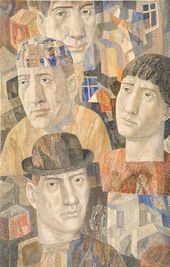 His graphic compositions based on that work, just like the earlier canvas "Five Heads”, are clearly marked by Filonov's influence. However, Zaltsman borrowed carefully from his teacher, mainly some general methods and, remaining essentially a devoted follower of Filonov, found his own vision in art. 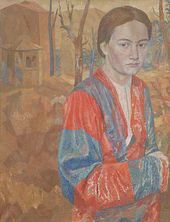 In the 1930s he painted single and group portrait compositions in oil, among them a refined portrait of Filonov's desciple, Tatyana Glebova, dressed in a multicolour Oriental costume, "Triple Portrait”, "Group with a Self-portrait”, and the paintings "Children” and "Watching a Contest”. The latter painting depicts Buryats whom Zaltsman observed during one of the film expeditions in which he participated. 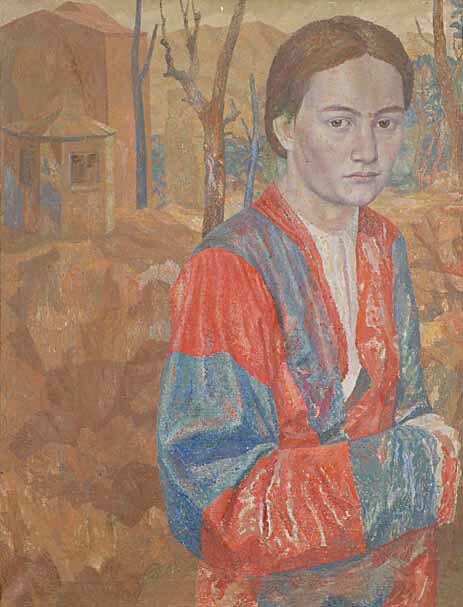 Halflength depictions which fill the whole space of the painting are made in his traditional artistic manner with virtually no elements of Filonov's "analytical method”. 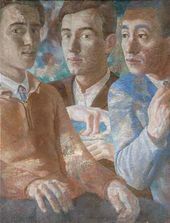 Nevertheless, this canvas, as everything that he created in the 1930s, is dramatically different not only from the formal "socialist realism” of the 1930s, but from the works of many other masters of that period who managed to preserve their individuality. The main difference is a spiritual impulse that distinguishes the images of the characters and that represents - as in Filonov's works - an aspiration to the divine mysteries of existence. Zaltsman's characters are focused on these mysteries, and not on a commonplace sport event; and it is the familiarizing with these mysteries that gives their gestures a somewhat ritual character. However, the characters of "Watching a Contest” and some other works of the 1930s are still on the border between the real, physical, and the metaphysical world. This was the period when the artist's images underwent a complete transformation and his authentic style was formed and shaped. This style can be regarded as a variation of the metaphysical art of the 20th century which stands close to that of Filonov. A typical example is an outstanding ink drawing "An Asian Port” (1937). As usual, Zaltman's characters fill almost the whole surface of the sheet of paper. Their gestures and movements seem static and frozen, outside time. Avariety of personalities and psychological states is used to express the profuse ways of spiritual comprehension of the Divine Principle. This comprehension can be compared with sailing into unknown seas, and this is where the title, probably, comes from. The figures are alternately outlined with a fine black or with a glowing contour. The artist uses chiaroscuro to shape the volumes but the light glides along the paper surface guided by some super-individual rhythms; the shadows are made with a finest network of strokes and points which are a metaphorical transformation of physical matter Equally immaterial is the landscape in the background. A school of worlds yet known to nobody. For Zaltsman, as for his teacher Filonov, painting was a "thought dwelling in the body”. In Zaltsman's art there is no such variety of themes and images, so typical for Filonov, no "polydimensional and immense” compositions recreating "entire worlds of visible and invisible phenomena”. But, like Filonov, Zaltsman tries to become a "witness of the invisible”. For him a human being is, in the first place, a spiritual vessel, and he managed to express that with great artistic power in the drawing "An Asian Port”. Having settled in Kazakhstan Zaltsman continued to paint but graphic art - large-sized watercolours and ink drawings - became his main preoccupation. One of the best such drawings is "One Has to be Courageous. Walking through the Night”. Created in 1951, when the dark nightmare of Stalin's regime seemed endless and hopeless, this work came as a hymn to human courage and to the search for sacred knowledge of the world, ongoing against all the odds. The figures of three men and a young woman, if compared to the characters of "An Asian Port”, are shaped more softly and shown closer. Though the characters remain motionless, the expressions of their faces and the whole set of images of the drawing create a feeling of progression. Zaltsman, as usual, expresses himself as a master of psychological portraiture. The young girl in the foreground and the young man behind her personify the beauty of youth, with its ability to dream, its fearlessness and belief. The elderly man and the older one bear the burden of the life behind them but their bitterness, tiredness and skepticism do not lessen their firmness and determination to "walk through the night”. The graphic works created later essentially preserve the stylistics of "Walking through the Night”. Zaltsman's characters appear to keep "walking”, but mainly they just stand before the viewer. We see men and women, dressed and naked, but, in the first place our attention is drawn to their faces. 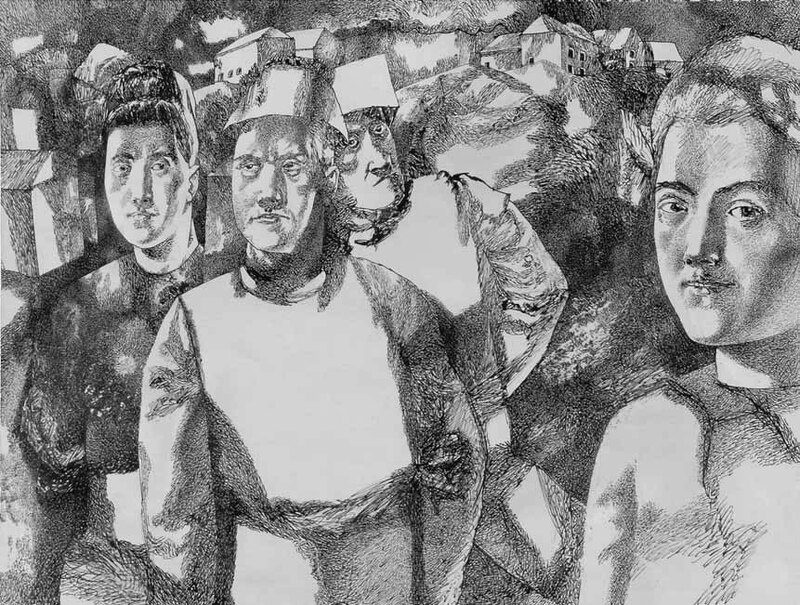 Mostly these are oriental images, young and beautiful, which by their harmonious beauty remind viewers of the characters of Renaissance paintings; or the faces of the old, misshapen by life's burden, sometimes grotesque - like in the poem by Zabolotsky and in the life of the artist, where reason lives together with folly. These faces are relaxed, contemplative, dreamy, immersed in hard thoughts, suffering, sad or smiling with a strange smile, calm and self-confident, suspicious and perplexed. The artist's contemporaries sometimes find themselves in his paintings next to Rembrandt dressed in an exotic oriental garment, or Charles Dickens in a top hat. Besides, in all his works Man is not only tensely peering beyond the limits of the visible and waiting for an answer to come from there, but is also submerged in it. Zaltsman often introduces white squares in his compositions - a fact most probably connected with the artist's recollections of Malevich, the sign of a higher divine ("suprematist”) reality. (It is worth noting that the artist paints not the black square which annihilates the visible world but a more neutral white one.) In his artworks the figures sometimes become immaterial, faces turn into masks and are separated from their bodies. The colour surface of his watercolours is split into tiny coloured particles, the volumes are shaped by the crossing of abstracting colour schemes. In the ink drawings the shaded white and black spots and planes play freely with each other. 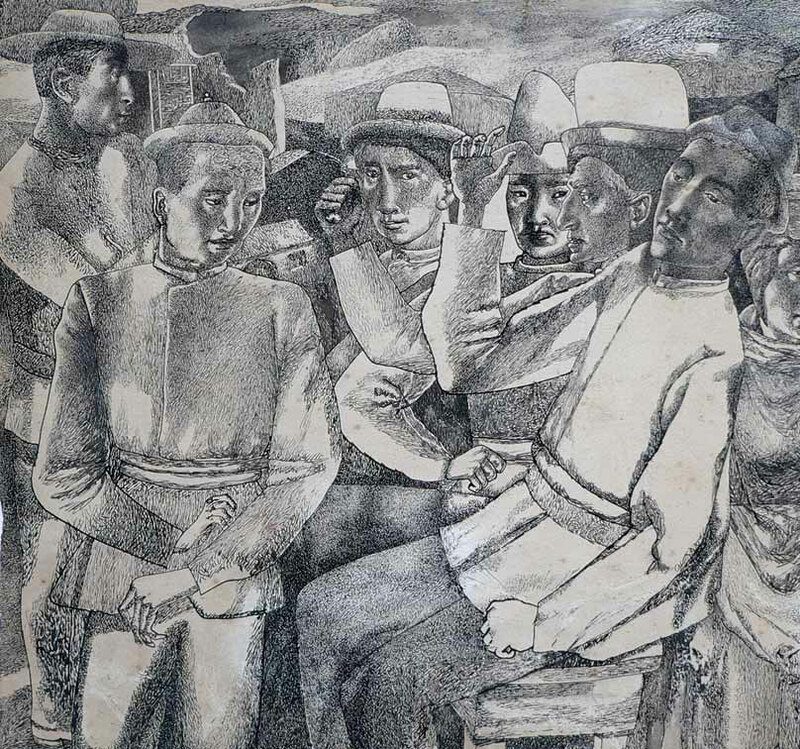 The variety of characters crowded within the limited space of the drawing sometimes evokes the author's associations with an Oriental bazaar. But even more often his images become similar to a theatre because the characters "pose” for the audience and move towards the edge of the sheet, just like the edge of the theatre stage, obedient to the artist's will and to an invisible director who stands behind him. The images are also similar to a "street” folk festival: in all religious cultures a festival is associated with going beyond the limits of everyday life. 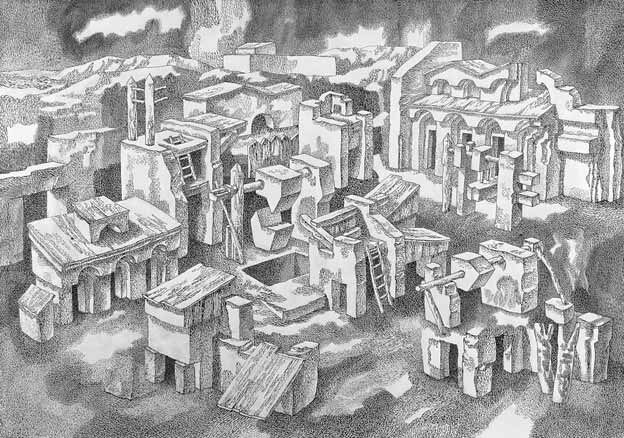 Almost all the compositions with figures have a background with half-real and half-fantastic buildings. 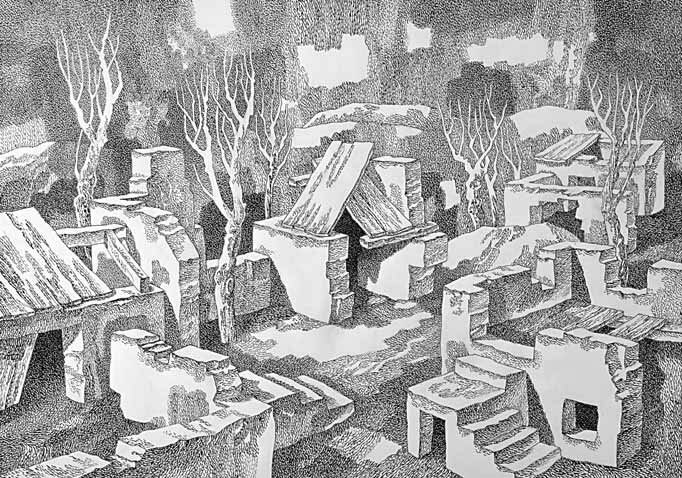 In some versions of the ink drawing "Mestechko” the background landscape occupies no less space than the figures themselves. In the same period Zaltsman created a series depicting deserted urban and rural landscapes. In spite of different titles given by the artist, all these works represent a complete estrangement of man from the surrounding environment. The buildings have elements characteristic of Asian or European architecture, seeming to form labyrinths with no exit. These are not only "deserted cities” but cities where no one can live: sometimes they are enveloped in flames as a reminder of the past war... The cycle "Experiments” features thoroughly realised surrealistic constructions with no hint of any sense. 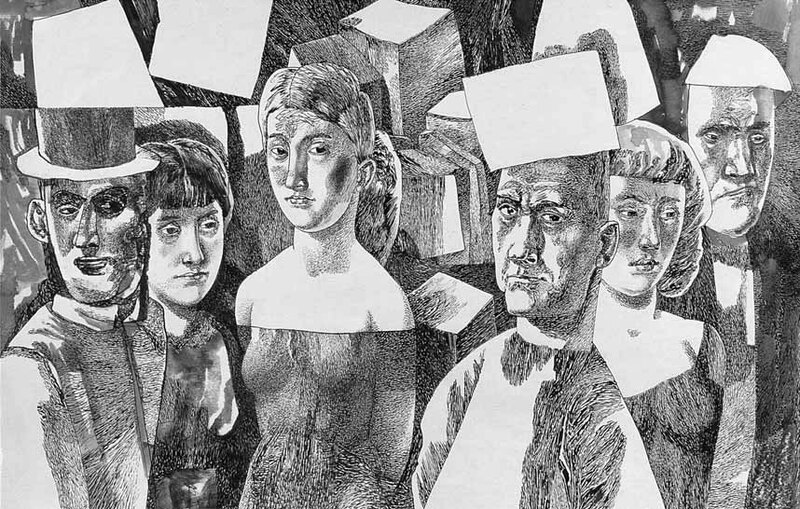 In all these drawings Zalt- sman, with all sincerity, openly speaks about the absurdity which he personally experienced, about the irrationality and brutality of totalitarian regimes, thus elevating the artistic images to a philosophical level. This motif can also be found in Zaltsman's literary heritage - in his recently published collections of stories and poems "Madame F” (Madame Fortuna). Both Zalysman's prose and poetry reveal some inner connection with Daniil Kharms and other members of OBERIUT group to whom the artist was close in the 1930s; or with Zoshchenko or with some early works of Zabolotsky. Zaltsman the author combines irony and street speech alongside humour based on alogical character of the contemporary with lyricism and religious- philosophical speculations. In his poetry Zaltsman very often appeals to God - he obviously has no other adequate recipient: he hurls accusations to Him, calls Him to account, and at the same time begs His forgiveness and sometimes contemplates mystical visions.